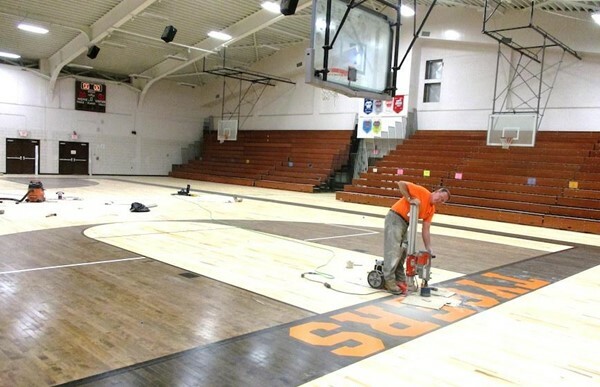 An employee of The Final Floor Co. worked in late August to complete installation of the Malabar gym floor. Mansfield Senior High’s home basketball games against the Madison Rams on Friday, Dec. 7, will be played on the new gym floor at Malabar Intermediate School. The Tyger freshmen will play at 4:30 p.m., followed by the junior varsity and varsity games. Installation of the floor, which began soon after school was out in May, was done by The Final Floor of Sugar Grove, Ohio. The contract for the work was $126,572. The new hardwood replaced the original gym floor installed when Malabar was built as a high school in 1962. Steam pipes which ran beneath the old floor had contributed to humidity and buckling of the old floor. District operations manager Bob Booth said those pipes are no longer operational. The new floor also has a vapor barrier beneath it, rubber strips between the plywood base and the hardwood. A $159,982 contract for the gym’s new heating, ventilation and air-conditioning system was awarded to Gardiner Service Co. of Solon, Ohio.